We have so many success stories at RSPCA ACT, and we often hear from members of the public with updates about how their newly adopted family members are settling in. However, it is rare for us to hear updates about native animals that we have released. We return native animals to the wild once they are strong and healthy again, and we just have to hope that they will go on to live a full life. Two years ago RSPCA ACT saw a tawny frogmouth come into the clinic in a bad way after being hit by a car. The tawny was in the care of our wildlife staff for four months while she made her recovery. After receiving a clean bill of health she was released. 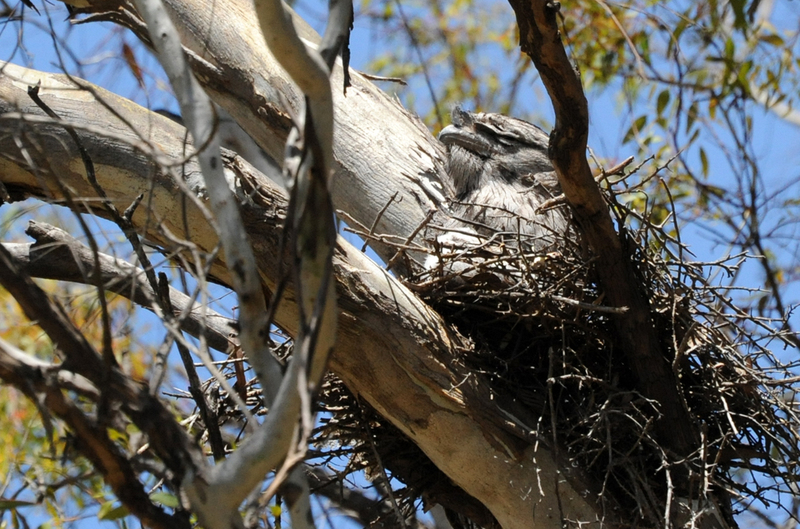 With a large number of tawny frogmouths in care at that time it was necessary to identify the birds with tags, ensuring that they would be released where they were found. Usually we remove the tags before sending birds back to the wild, however this tawny ended up being released with her tags intact. Imagine our surprise and delight when local wildlife enthusiast Stuart Rae spotted her nesting! Stuart has written a number of blog posts about ‘Double Pink’, and this week shared the exciting news that she has successfully started a family. Tawny frogmouths are stunning birds, and as you can see from the pictures they do a very good job of blending in to their environment. A big thank you to Stuart for spotting her, keeping an eye on her and keeping us updated on her progress, and also for allowing us to share these beautiful photographs. RSPCA ACT is the only licensed wildlife carer in Canberra. If you would like to learn more about what to do when you find an injured native animal, visit our website. You can also make a donation to help us continue our important work caring for wildlife in the Bush Capital.